Rugged and Waterproof: The ToughCase meets IPX-7 standards enabling the device to be submerged at a depth of 1-meter for up to 30 minutes. 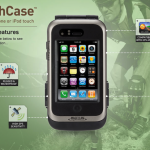 Extended Battery Capacity: The ToughCase includes an internal battery that charges your iPhone or iPod touch. The 1840 mAh battery will double your battery life based on normal operation. Built-in High Sensitivity GPS: The ToughCase has an integrated SiRFstarIII GPS chipset that improves reception accuracy to 3-5 meters or 10-15 feet leveraging SBAS systems, such as WAAS, EGNOS, and MSAS. Compatible with GPS and Location Based apps for iPhone or iPod touch: Choose from thousands of GPS, location based, and navigation apps available on iTunes, including the Magellan RoadMate App for iPhone or iPod touch. Compatible with all GPS and Location Based iPhone apps: Choose from thousands of GPS, location based, and navigation apps available on iTunes. Completely Interactive: Access to the touch screen, hard buttons, and audio jack. Continue to use your iPhone or iPod touch while it is protected from the elements. 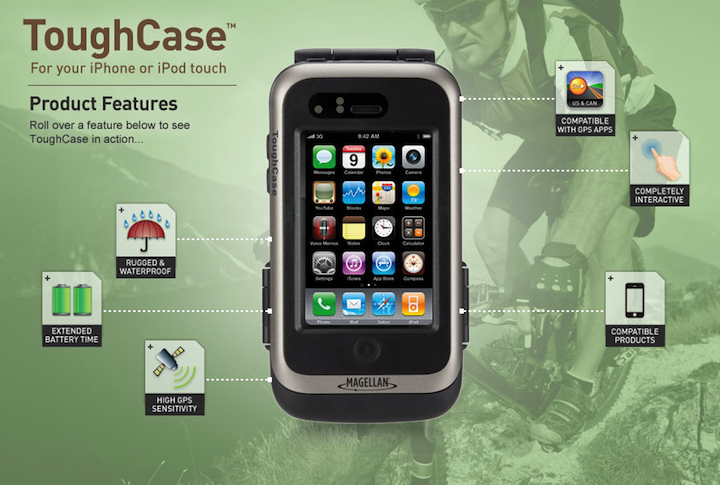 The ToughCase is available now for $179.99 online and at retailers nationwide.